Gosh, the summer has flown by. Was it the same for you? This blog has fallen a little by the wayside… I’m still here, just less frequently and with fewer of my “own” recipes, especially now that I can save all my favorites to NYT Cooking. Even though I’m posting fewer recipes doesn’t mean I’ve stopped cooking…on the contrary, our kitchen remains an exciting and comforting place amidst the stresses of daily life. Here’s a peek into what F and I have been cooking over the past few months, in no particular order. Ottolenghi’s “Chickpea Saute with Greek Yogurt” — light and bright summer flavors went beautifully over rice with a rich and creamy Greek yogurt sauce on the side. Highly recommended and very easy to throw together on a weeknight. Pasta with Zucchini, Ricotta and Basil, courtesy of David Tanis at NYT Cooking. Creamy and rich yet summery, thanks to lemon zest and basil. The Woks of Life’s Shanghai-Style Braised Pork Belly — it took 3 hours but was totally worth it for the melt-in-your-mouth texture of the pork belly in rich, sticky sauce. So so good. We will definitely make it again on our next leisurely weekend. Melissa Clark’s Lunchbox Harvest Muffins (NYT Cooking) are moist and not dense at all, despite using only whole wheat flour. They’re packed with grated apple, carrot, and zucchini and made great afternoon snacks for F and me during the workweek. We made Martha Rose Shulman’s Spicy South Indian Cauliflower for the second time. F browned some cubes of paneer cheese to add in and I made naan bread to go on the side. I had always wanted to try making bircher muesli and finally did this summer. I used Nigella’s “basic bircher muesli” recipe and it turned out exactly like I’d hoped. Last week I made a double batch, which got us both through two weekday breakfasts. These blueberry pancakes are SO FLUFFY, thanks to whipping the egg whites before folding them into the batter. Rather have blueberry muffins? I made some of those, too: Call Me Cupcake’s blueberry lemon muffins were just right and didn’t even need the cardamom topping, in my opinion. What have you been cooking? Four Years Ago: Moist Apple Hotcakes and Simple Applesauce — apple season is arriving! Five (!) Years Ago: “‘The time has come,’ / The Walrus said…” and Weekend in D.C. This entry was posted in food, health, Highlights, pictures, recipes and tagged bircher muesli, blueberry muffins, blueberry pancakes, breakfast, brunch, Chinese, David Tanis, Friday dinner, Greek Yogurt, Indian, leftovers, life, Martha Rose Shulman, Middle Eastern, muesli, muffins, NYT Cooking, pancakes, pasta, smitten kitchen, stew, weeknight dinner, zucchini on 20.09.2015 by taplatt. Every summer since I can remember, my dad has made an amazing basil pesto with basil from the garden. He used to make it with pine nuts — the classic combination — but those are so expensive now that he has started using a mixture of pecans, walnuts, and almonds. We always eat it on whole wheat spaghetti — the secret to extra creaminess is a dollop of buttermilk or yogurt — with frozen peas on the side. F and I had been wanting to make pesto for a while, and when Simply Recipes published a pesto recipe — which coincided with Cookie and Kate posting this dish — I knew it was time. My dad has always used the classic Silver Palate recipe, but as I forgot to write it down during my most recent visit, I went for the Simply Recipes version. Making pesto is so simple and satisfying: combine basil, nuts, cheese, garlic, and olive oil in a food processor, and blend until smooth. Toss with pasta or spread on pizza or a sandwich. Do you have a favorite pesto recipe? How do you like to eat it? Place the basil and garlic in a food processor and pulse until blended (you can use an immersion blender if you don’t have a food processor). Add the cheese and nuts and continue pulsing until the mixture is uniform. Slowly add the olive oil while running the food processor continuously. Keep blending until the pesto reaches your desired consistency. Stir in salt and pepper. Note: If you’re adding pesto to pasta, reserve/mix in 1/2 cup of the cooking liquid per 1 cup of pesto. This entry was posted in family, food, full meals, health, pictures, recipes and tagged basil, basil pesto, pasta, pesto, pesto recipe, Simply Recipes on 25.08.2014 by taplatt. A travel-related post on our lovely week in southeastern Spain is coming soon. While that’s in the works, here’s a summery pasta salad that I made for a simple late dinner on a warm Spanish night. We enjoyed this with some grilled zucchini and eggplant — and chorizo for F — on the side. It’s great slightly warm or cold for lunch the next day (with the leftover grilled veggies chopped up and mixed in). This pasta salad is a great base for experimentation — you can add or subtract ingredients as you like. Let me know what your favorite combination is! Cook the pasta as directed. While the pasta is cooking, chop the tomatoes and place them in a large bowl. When the pasta is finished, drain it and add it to the bowl with tomatoes. Add the cheese, a few glugs of olive oil, salt and pepper, then toss until everything is well-combined. Add the arugula and toss again. This entry was posted in climate, culture, food, full meals, health, pictures, recipes, travel and tagged Arugula, Friday dinner, leftovers, pasta, pasta salad, salad, weeknight dinner on 16.06.2014 by taplatt. smitten kitchen for the win — yet again. Almost every recipe of Deb’s that we’ve tried has turned out well. I know I’ve waxed poetic about smitten kitchen before, but it’s true. And this baked pasta is no different. Decadent and cheesy, yet surprisingly light. So delicious that F and I couldn’t help having seconds. Nutmeg-y béchamel enrobes pasta, cheesy pockets of mozzarella, and little nuggets of sausage with broccolini on top — what’s not to love? In all honesty, F prepared this while I was out and about — kudos to him for excellent execution, as always. He makes a mean béchamel and, sauce lover that he is, made a bit more than the original recipe called for. We used caramelized onion sausage, which added a pleasant and subtle sweetness to the dish. Instead of chopping the broccolini (which we used instead of rabe), we lay the stalks whole on top of the pasta before covering everything in parmesan and baking it. This is basically grown-up mac and cheese, and totally counts as a one-dish meal, though we had some green beans and a salad on the side for good measure. The flavors are reminiscent of broccoli-cheese soup; this is like the deconstructed version. Go make it now, and you’ll understand what I mean. Three Years Ago: Weekend in D.C. and End of Week 1. Cook the pasta as directed. Five minutes before the pasta is done, add the broccolini to the pot. When everything is done cooking, drain the pasta and set the broccolini aside. While the pasta is cooking, remove the sausages from their casings and cook in oil over medium heat, about 5 minutes or until browned. Remove from the pan and set aside. Make the béchamel: Melt butter over medium heat in the pan you cooked the sausages in. Stir the flour into the melted butter until smooth, then cook for 1 minute. Slowly pour in the milk, whisking constantly. Season with salt, garlic, pepper, and nutmeg, then let the sauce simmer for 10 minutes, stirring frequently. Combine the pasta, béchamel, sausage, mozzarella, and half the parmesan. Stir and spread into a large baking dish. Arrange the broccolini stalks on top, then sprinkle the rest of the parmesan over everything. Bake for 15-25 minutes or until the top is browned and crispy. This entry was posted in food, full meals, pictures, recipes and tagged Friday dinner, leftovers, pasta on 22.09.2013 by taplatt. Yesterday I stumbled upon this recipe featured on Great British Chefs. The recipe gods must have been in sync with our kitchen, because we had all the necessary ingredients — even halloumi, which we had bought intending to grill on the weekend but didn’t because the weather hadn’t cooperated. I immediately sent the recipe to F, asking if he’d like that for dinner (and knowing he’d say yes — who can refuse the combination of cheese and noodles?). Side note: After deciding to cook this pasta dish, I checked out its place of origin, The Cutlery Chronicles, which is a beautiful blog written and maintained by a Londoner. Let’s just say it didn’t take long for me to add the blog to my Reeder feed. This recipe is so simple. It is fresh and light, yet filling. We enjoyed it as almost a noodle soup, taking Leyla’s advice to serve the noodles with some of the broth they are cooked in. The broth draws out the creaminess of the cheese and the lemon brightens everything up and complements the mint well. I added frozen peas to my version and used lamb stock rather than chicken stock. This dish is also perfect for a weeknight dinner, as it easily comes together in less than half an hour. It can be a full meal by itself but is also nice with a side of salad. Grate the halloumi and mix it with the mint and pepper. Set aside. Bring the water with stock cube to a boil, then add the pasta. The water should just cover the pasta, so pour out any excess you may have. Cook the pasta as directed on the package. Add the peas to the pasta water 5 minutes before the pasta is finished cooking. Prepare your bowls by spooning some of the cheese-mint mixture into the bottom of each shallow bowl. When the pasta is finished, ladle some pasta with broth into each bowl. Sprinkle more cheese mixture over this, then add another layer of pasta, if desired, and a final layer of cheese. Finish with up to half a lemon’s worth of fresh-squeezed juice. Serve the noodles warm, and don’t forget your soup spoon to polish off that broth! This entry was posted in food, full meals, health, pictures, recipes and tagged Friday dinner, pasta on 11.06.2013 by taplatt. So what can I say about these two dishes? First and foremost, they are delicious. Many cultures and countries have their own version of apple pie: some use a double crust, some use lattice, some use crumble topping, some are crustless, some are more cake-like (but then that would be apple cake and not apple pie). Somewhere along the historical timeline, Americans adopted apple pie and it has become a national dish of sorts. Maybe it’s just because I’m from the northeast and so many apples grow here in the autumn that we must come up with creative ways to use them. In any case, apple pie is great year-round and is popular both at 4th of July (Independence Day) celebrations and Thanksgivings around the USA. My dad makes a killer crust and uses plenty of cinnamon and a light crumble topping in his apple pie. Now on to macaroni and cheese. The idea is really quite simple: cooked elbow macaroni mixed with a white/cheese sauce and baked. Though Italy is obviously the king of pasta, mac and cheese has come to be primarily associated with American — especially Southern — cuisine. Many Americans grow up eating boxed mac and cheese (just add butter, milk, and that weirdly-bright orange “cheese” powder) on nights when the parents go out and a babysitter comes. I ate my fair share of boxed mac and cheese as a kid, but my brother and I were also lucky to grow up with parents who love to cook and have a great homemade macaroni and cheese recipe that we call “Grandma’s Mac and Cheese” (“Grandma’s” because it’s the recipe my maternal grandmother always made when my mom was growing up). For some reason we always eat frozen peas (reheated, of course) alongside — or mixed into — our mac and cheese. It is also delicious with leftover ham chunks mixed in. Read on for the recipe, and happy American cooking! Preheat oven to 375F. Lightly oil a casserole and distribute half the parmesan around the bottom and edges. Cook the macaroni as directed and drain it. Meanwhile, melt butter in a medium saucepan or double boiler. Remove it from the heat and stir in the flour, salt and pepper until smooth. Gradually stir in milk. Return to the heat and bring to boiling, stirring. Reduce heat and simmer mixture 1 minute. Remove from heat and stir in 1.5 cups cheddar cheese and the cooked macaroni. Pour entire mixture into the casserole and sprinkle the remaining cheddar and parmesan over the top. Bake 15-20 minutes or until the cheese is golden-brown. 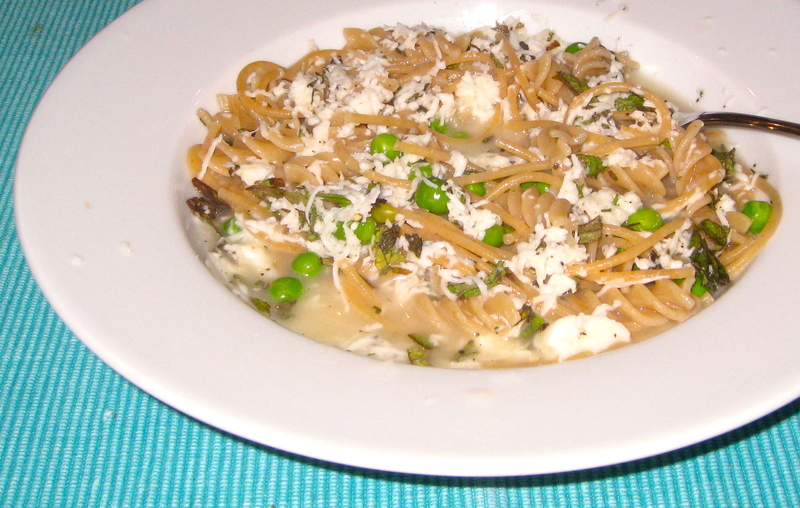 This entry was posted in culture, family, food, history, pictures, recipes and tagged pasta on 15.12.2012 by taplatt.